Khat (Catha edulis) is a plant of uncertain and highly controversial status grown in the countries around the Red Sea and on the eastern coast of Africa. The chewing of khat leaves has a deep-rooted religious and socio-cultural tradition. 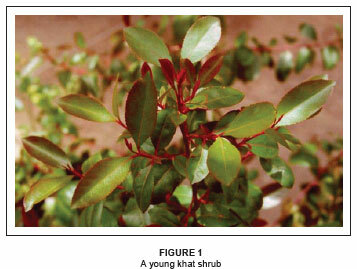 Khat is considered a cash crop and its cultivation is a source of economic value to the societies and nations involved. There have, however, been reports of negative economic effects on the individuals engaging in the habit of khat chewing. The increasing use of khat worldwide, along with the negative international attention that this has garnered, has led to the present status of uncertainty of the once indigenous practice of khat chewing. Scientists, mostly western Europeans, have tended to focus on problems related to khat with little attention to the positive role of khat chewing in society and the world at large. In addition, no report has directly associated khat with any organised crime, violence or antisocial activity, particularly in countries where khat is legalised. 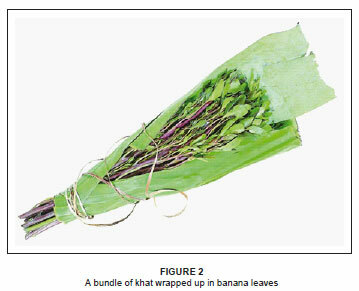 This paper reviewed the various areas of uncertainty and controversy relating to khat. Based on the findings of the review, further qualitative and quantitative research is required and a positive international approach to khat use at economic, religious and socio-cultural levels is advocated. Many different compounds are found in khat, including alkaloids, terpenoids, flavonoids, sterols, glycosides, tannins, amino acids, vitamins and minerals.5,13 The phenylalkylamines and the cathedulins are the major alkaloids. The cathedulins are based on a polyhydroxylated sesquiterpene skeleton and are basically polyesters of euonyminol; 62 different cathedulins have recently been characterised from fresh khat leaves.14 The khat phenylalkylamines comprise cathinone (s-[-] cathinone), which is the primary constituent of khat, as well as two diastereoisomers: cathine (1S, 2S -[+]- norpseudo-ephedrine or [+] norsendoephedrine) and norephedrine (1R, 2S -[-]-norephedrine), which are the secondary constituents. These compounds are structurally related to amphetamine and noradrenaline. Cathinone is found mainly in the young leaves and shoots. Khat sessions often have a cultural function as well.43,44 At festivities, feasts and rituals, including birth, circumcision and marriage, adult guests often chew khat, which heightens their enjoyment of the occasion. Khat trade is not illegal in the UK; a known market and a distribution network for the drug do, in fact, exist and the use of the plant in certain locations is substantial.34 Khat is native to the eastern and southern regions of Africa but is grown extensively as a cash crop in Ethiopia (where it is freely available and is a highly valued export commodity5), in Yemen and in the northern provinces of Kenya. It is also socially and economically important in the neighbouring areas of Somalia and Djibouti. Khat is profitable to the huge number of people involved in its production and marketing, including farmers, distributors and merchants. The taxes imposed on khat are also an important source of revenue to governments.1 In Yemen, for example, estimates in the early 1980s - before the production of oil - attributed 30% of the gross domestic product to khat.50 Yemeni khat is not exported, however, and its macroeconomic significance is therefore not pronounced, as is the case in Ethiopia. However, studies have reported that the regular consumption of khat may be associated with various social and economic problems affecting both consumers and their families.33 In Yemen, for example, much time is spent buying and chewing khat, affecting working hours and time with family.13 For some, the daily cost of the khat habit exceeds their expenditure on food for their families. At the family level, khat may therefore be damaging to budgets, especially among the poor. In the late 1980s, Kennedy1 estimated that 10% of the Yemeni population suffered economic hardship due to khat use; this figure would have increased by now due to the economic deterioration since the early 1990s. Others again argue that moderate use improves performance and increases work output, owing to the stimulating and fatigue-postponing effects. Working hours and possibly productivity may therefore decrease when khat is not used because of anergia and reduced motivation. Khat chewing has a deep-rooted religious and socio-cultural tradition. It is especially highly regarded as a social event, where it is used for recreation and relaxation. For the participants in khat sessions, it is also a way of redefining their identity and reinforcing self-esteem both at home and as migrants in an alien society. At the same time, khat sessions are an important source of news from home and an opportunity to exchange information on the society in which those involved in khat chewing find themselves. The legality of khat, however, varies from country to country. The economic effect of khat on individuals and societies that engage in khat chewing furthermore seems uncertain; these uncertainties make the habit of khat chewing controversial and ambiguous. The increasing use of khat worldwide and the negative international attention have led to the present uncertain status of this once indigenous practice. Scientists, mostly western Europeans, tend to focus on the problems related to khat, with little attention being given to the positive role of khat chewing on indigenous societies and on the world at large. Moreover, from the review of relevant literature, there seems to be no report directly associating khat chewing with criminal activities, violence or antisocial activities, particularly in countries where khat is legalised. Based on the findings of this review, and before a conclusive statement can be made on the status of khat at local, national and international level, there is a need for an international conference of stakeholders, including traditional and indigenous people of khat-using origin. The need also clearly exists for consensus, for scientific and joint qualitative and quantitative studies on khat. Lastly and, most importantly, a positive approach to khat use at religious, cultural, economic and social levels is advocated.